WE MANUFACTURE AND SUPPLY ALL TYPES OF CONTROL PANELS FOR INDUSTRIAL HEAT TREATMENT FURNACES,CONTINUOUS HEAT TREATMENT FURNACES,CONVEYORIZE HEAT TREATMENT PLANT,HI TEMPERATURE FURNACES,TESTING FURNACES,HEAT TREATMENT FURNACES FOR FORGING INDUSTRIES,SOLDERING FURNACES,ANNEALING FURNACES,ROTARY FURNACES,HARDENING FURNACES,TEMPERING FURNACES,STRESS RELIEVING FURNACES, NORMALIZING FURNACES,GAS CARBURIZING FURNACES,SPARES AND ALLIED EQUIPMENT. Capitalizing on our synergies as a vertically integrated company, we are reckoned as an eminent manufacturer, exporter and supplier of Control Panel For Furnaces. The offered control panel is available in different specifications, which fits the diverse needs of the patrons. 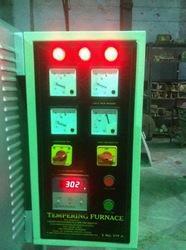 Our offered control panel is developed using excellent quality material in order to meet the set industry norms. Additionally, patrons can avail the offered control panel within a given time frame. 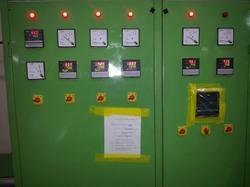 Looking for Control Panels,Transformers For Furnaces ?